However, the past has a nasty habit of catching up with you when you least expect it. And so, while on a mission for the Rebellion, Carlotta runs into Darius Gilroy, crime lord, all around scumbag and her former boss. Gilroy had a job for Carlotta and he won’t take no for an answer. And to emphasise his point, he threatens to hand her over to the Empire, if she doesn’t accept. Debts to Pay is a novella of 18200 words. This story is a digital premiere and has never been published previously. This novella is part of the Shattered Empire saga, a series of more or less loosely connected novellas about the great rebellion against the Fifth Human Empire told from the POVs of the people who fought it. Debts to Pay has an interesting background, because it is an extensive rewrite of a science fiction short story called The Nighthuntress that I wrote twenty years ago. The Nighthuntress was originally not a Shattered Empire story at all, but loosely tied in to another Galactic Empire series called the Femla series that I developed in my teens and twenties. In fact, the original draft of The Nighthuntress is one of the very few full Femla stories in existence, everything else is strictly fragments. 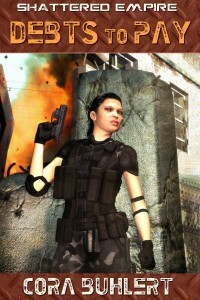 Unlike Debts to Pay, the original draft of The Nighthuntress was a fairly short and straightforward story of a female Femlan operative with rebel sympathies who is sent to a semi-autonomous planet called Fakul VII, which was rather important in the Femla continuity, to take down a drug lord, blow up his lair and steal the formula for a drug. She does everything but steal the formula and goes home. There was no Darius Gilroy figure nor any Smoofs in the original draft, instead the employer of the unnamed heroine was “the government” and the drug was never defined. When I started indie publishing, I went through my inventory of finished stories and also came upon The Nighthuntress. I initially put it towards the back of the queue, because it was so very old and tied to a largely obsolete series. When I finally pulled out the story again, I noticed that bits were surprisingly good for something so old. By now I had started working on the Shattered Empire series, so it occurred The Nighthuntress could be rewritten as a Shattered Empire story with Carlotta Valdez in the lead. Carlotta’s signature red hair ribbon and its meaning are another carry-over from the original version of the story, where wearing a red ribbon somewhere on one’s body to designate that one had spilled blood was a galaxy wide custom. Here it is just a custom on Carlotta’s homeplanet of Aguilar. The flashback to Carlotta’s teen years on Aguilar and to her killing the soldier in the alley is a much expanded variation on a one paragraph flashback in the original story. The Smoofs were introduced during the rewrite and are actually the first non-human race we see in the Shattered Empire series. The colloquial name of the alien race is a play on SMOF, an acronym that stands for “secret masters of fandom”. Though for the record, I don’t believe that SMOFs should be turned into drugs. So, Arthur and Carlotta… I bet you didn’t see that one coming. To be fair, neither did I. They simply surprised me that way. On the plus side, we now know who Carlotta’s mystery lover is. In the closing scenes, we also meet Alanna Greyskull, Arthur Madden’s assistant and right hand and basically the person who is keeping the rebellion running, because Arthur is better at making inspirational speeches than at day to day organisation and they both know it. You’ll be seeing more of Alanna in future installments. The cover image is digital art by Luca Oleastri via Dreamstime and perfectly depicts how I see Carlotta.